XUAN LOC - Wolfhound and Bobcat reconnaissance operations near here destroyed 68 reinforced enemy bunkers during a recent four day period. The 2nd Brigade units also uncovered a number of enemy supplies. On the first day, Bravo Company, 1st Battalion, 27th Infantry Wolfhounds, located 12 bunkers with four feet of overhead cover, a mess area, a classroom area and three small buildings two miles northeast of Fire Support Base Kirk. Ten pounds of medical supplies were also evacuated by the Wolfhounds. 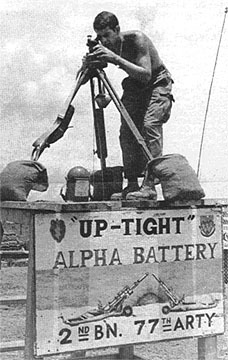 Alfa Company, 1st Battalion (Mech), 5th Infantry Bobcats, destroyed 17 other bunkers with two and a half feet of overhead cover in a hilly region two miles northwest of Fire Support Base Swartz the same day. The Bobcats also found one enemy soldier killed by artillery and a small amount of medical supplies. The next morning Delta Company Wolfhounds moved into an area three miles east of FSB Kirk where they destroyed 15 more bunkers, a classroom structure and another small building. On the third day the Wolfhounds' Bravo Company went back to the area northeast of their fire base and destroyed another six bunkers by late afternoon. The Bobcats' scout platoon, operating in the same area, destroyed 35 sleeping positions and a small number of cooking utensils. By late afternoon on the fourth day, Charlie Company Wolfhounds had gotten into the act and destroyed 18 more bunkers in the area northeast of FSB Kirk. TAY NINH - Vietnamization caught up with one of America's most vital bases recently when part of Tay Ninh base camp was officially turned over to the Army of the Republic of Vietnam (ARVN). The ARVN took over complete control and responsibility for the eastern section of the large base camp, formerly occupied by one brigade of the 1st Air Cavalry Division and, until last December, the Philippine Civic Action Group. 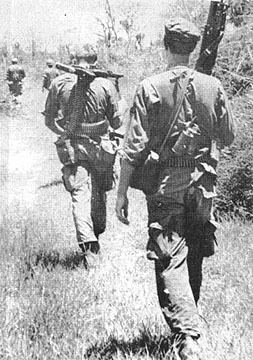 For the ARVN it was a big step in Vietnamization. Tay Ninh base camp, guarding the populous metropolitan Tay Ninh City area and lying in the shadow of the Black Virgin Mountain (Nui Ba Den), is of vital strategic importance. FSB LYNCH - A male blonde Caucasian was spotted among a group of enemy soldiers by the Wolfhounds of Alfa Company, 1st Battalion, 27th Infantry near here recently. 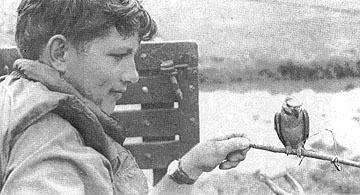 As the point element of Charlie Company, a scout dog and handler from the 66th Scout Dog Platoon, approached a small clearing, the animal alerted to the presence of the enemy. The team moved to the edge of the clearing and spotted two enemy moving away from them and slightly across their path. The handler opened fire and wounded one of them, causing him to drop his AK-47 and run into the woods. Following heavy blood trails and numerous other visual signs, the Wolfhounds spotted another group of six to eight NVA soldiers - this time with an unusual addition. One of the men was a blonde Caucasian. "I was ready to fire," said Staff Sergeant Joseph Burnett of Tryon, N.C., who was near the front of the Wolfhound element. "But I saw this blonde guy in the middle. "They were in line and heading away from us, about to go into the woods," Burnett continued. "I figured the guy must be a prisoner, and I didn't want to shoot him. So I engaged those behind him. He didn't seem to try to escape but ran with the rest of the NVA into the woodline where we lost them." Along with the one rifle, the enemy left behind five rucksacks containing medical supplies and clothing. The identity of the stranger remains a mystery. TAY NINH - Alfa and Charlie Company Manchus recently swept through the area near here, destroying enemy bunkers and uncovering a large enemy cache. Charlie Company, working with two Regional Forces companies, served as a blocking force as a rallier led the Vietnamese to a cache holding nearly 22 tons of enemy foodstuffs and ammunition. The 4th Battalion, 9th Infantry soldiers were supporting the 216th and 218th Regional Force companies in the search of a marshy area west of the Rach Cai Bach River near Cambodia. As the three units moved into the area during early afternoon, they came under small arms, machinegun and rocket propelled grenade fire from an undetermined number of enemy. The allied units returned fire with their assault rifles and machineguns and called for support from helicopter gunships, mortars and forward air controllers who fired rockets into the enemy stronghold. The battle lasted for more than an hour with the RFs taking the initiative. After contact ended, a search by the RFs revealed they had killed five enemy. FSB KIEN -- Elements of the 3d Battalion, 22nd Infantry, combined with local force units recently to help provide security for elections held in nearby villages and ARVN compounds. For two weeks prior to the elections, Alfa and Bravo companies worked closely with Vietnamese Regional Forces (RF). The resulting stability enabled the people to vote without fear of enemy harassment or intimidation. Local units of Xom Dua, Co Trach and Ben Chua took part in the combined operation. The American troops worked with the groups as part of the Vietnamization program in this area. The objective was to improve the Regional Forces' ability to provide their own security and consequently, security for the elections. Formal training was given in tactics, small arms proficiency, airmobile operations, compound defense, road clearing and village security. Training in daylight and night combat maneuvers was also stressed. One of the major goals was to inspire confidence in the RF's abilities by working with them at greater distances from the compounds and villages. "They're the best RFs I've ever worked with," said Alfa Company Staff Sergeant Joe Ganster, W. Reading, Pa., whose unit worked at Ben Chua. "When the VC ran into one of their night positions, the RFs reacted quickly. About twenty of them followed up their own mortar attack, searching the area thoroughly for enemy casualties." In working with the RF forces, "close cooperation was vital, enabling the operation to be successful," said Captain Julius Keller, Philadelphia," company commander. CU CHI - Larcenies are currently on the upswing in the Tropic Lighting Division and you could well be the next victim. Typical is the case reported to MPs of a you NCO who placed his wallet containing $500 under his pillow before retiring for the night. Leaving the unlocked hootch the following morning, he returned shortly to find the wallet most conspicuous by its absence. On a much larger scale, members of the Criminal Investigation Detachment (CID) were recently confronted with the theft of an estimated $5,000 from a company safe. "The combination lock on the safe had malfunctioned and they were using a couple of padlocks. The thief didn't have any trouble with them," said Ralph Booth, a CID Investigator from Phoenixville, Pa. The 25th Military Police Company records one case of thievery per day. "Steroes, TVs and radios are the items most often taken. Watches and money are next on the list," revealed MP Specialist 4 Kenneth Mennell, of Clevland, Ohio. Hootch-maids and other civilian personnel are often the first to be blamed by the GI victim when something turns up missing. "We usually find that Mama-san isn't the thief. They know that if they're caught we'll turn them over to the NPs (National Police) and they'll be banned, permanently, from the base camp," said MP Specialist 4 Robert Johnson, Dayton, Ohio. "Most of the time when we find something that's been stolen, it's another GI who's taken it," continued Johnson. "A lot of these guys aren't aware of the consequences. They can get a stretch in LBJ (Long Binh Jail) for the first offense," he added. There is some consolation, however, for victims of light-fingered thieves. "If the individual's property was adequately secured he can file a claim against the government for compensation," said Mennell. XUAN LOC - The advantages of combined allied operations were displayed here recently during a mission in which Charlie Company, 1st Battalion, 27th Infantry, teamed up with elements of the 66th Regional Force (RF) Company. The Wolfhound - RF strike force had been airlifted into a jungle landing zone where it came under heavy enemy fire. "The RFs proved to be tough soldiers in a tight situation," said one of the Hounds. "They were instrumental in spotting enemy positions and directing return fire, causing the enemy to break contact." Later, when the allied forces came under enemy mortar attack, the RFs helped to direct Charlie Company's own 81mm mortar section which successfully silenced the enemy gunners. Sergeant Jerry Titus, of Redmond, Ore., platoon leader for Charlie Company, said of the operation, "These people (the RFs) are growing stronger by the minute, and I'm confident that they can handle anything the enemy throws at them. They were a real asset to the mission today." CU CHI - Free food, live entertainment, champagne, and general good times pretty well describes the festivities that adorned the opening of the new Taro Leaf Snack Bar her recently. The activities began with the dedication of the new snack bar by Colonel T.J. Hanifen, chief of staff. 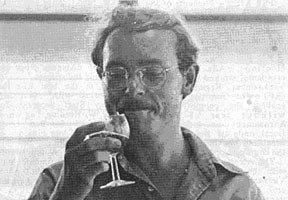 At that time, an Army Commendation Medal was presented to Specialist 4 Sheldon R. Morris, of Los Angeles, for the successful completion of the snack bar. Then, after having been under construction for about three months, the new snack bar opened it's doors and the celebration began. While patrons devoured all the free food they could eat, the combination rock group and acrobatic team provided the entertainment. A good time seemed to be had by all. As one man put it, "This is more like it." SGT Leo Gervais, Co C 65th Engr. Bn., boy. The TROPIC LIGHTNING NEWS is an authorized publication of the 25th Infantry Division. It is published weekly for all division units in the Republic of Vietnam by the Information Office, 25th Infantry Division, APO San Francisco 96225. American Forces Press Service and Army News Feature materials are used. Views and opinions expressed are not necessarily those of the Department of the Army. Printed in Tokyo, Japan, by Pacific Stars and Stripes. CU CHI -- Information compiled from enemy detainees through the combined efforts of psychological teams and line companies of the 25th Division 's 2nd Battalion (Mech), 22nd Infantry, on operations near here has provided a keen understanding of the enemy in hiding. One such soldier, Duong Duc Ha, was a guerilla fighter for 25 years. At age 12, he became a Viet Cong soldier and eventually attained the rank of captain. This is his story, compiled from interrogation reports and his diary. I was infiltrated into South Vietnam when very young. Years went by that seemed like centuries. The search for the enemy was constant, but supplies and men were always but few. JULY 13, 1966 -- Today, many of my men are sick, very sick. By daylight over a quarter of my company will die. The cause is the mosquito. I have orders to move on to another unit closer to American and Vietnamese forces. NOVEMBER, 1966 -- The search for the enemy becomes long. The heat combined with darkness; the life underground without light. We dig into the hard dirt day after day. Food and arms become scarce for my men. The enemy finds and destroys our homes and food supply. Now replacements are fewer. MARCH 1, 1967 - Today we had orders to move to a new area to secure a shipment of arms. We reach the rally point but no one comes. We stay and wait the hideous wait. Someone comes. The noise is unknown to us. It is the enemy but we have only a few arms and munitions with which to fight. "Run," I say. Months go by and still no food to feed all my men. There's never enough rice to eat. When we are hurt we haven't medicine to take care of our wounds. When we die our bodies are thrown somewhere our families don't know of. 1969 - Last year the Party issued what they called the general attack and up-rising. We look back now, the result is nothing. We see only blood flowing in all the land. We see this, but our higher ranks always say "Fight, Fight!" We see the shortages of ammo and weapons; our personnel gradually die off, night and day. Life underground is so bad; we await inevitable death, exhausted. We live in such poor conditions, but the higher ranks take no notice of us. They live happily in the holy land of Cambodia. How do they know about our sorrowful lives? The Revolution distorts the truth .... The National Army in South Vietnam becomes stronger and more steady. We become tired of being ill-treated by the Party. We grow tired of fighting the never-ending war. MAY 1970 - The time in the war is very short. The fear and hesitation to charge is great. Soon I will go to the friendlies and Chieu Hoi. It is time we give our young a happier future. WHILE THE BANDS BURNED ON ... Never let it be said that the 1st Hounds don't play by the rules. In a recent reconnaissance operation near Fire Support Base Kirk, the men of Delta Company uncovered 60 bottles of penicillin and a box of rubber bands. The Wolfhounds, in accordance with the rules of land warfare, evacuated the medical supplies. Then, with total disregard for their beloved company clerk, they unceremoniously destroyed the box of rubber bands. Alas. HERE TODAY, GONE TOMORROW ... Since March, the Wolfhounds of the 1st of the 27th have been playing musical fire bases, moving no less that four times. From Fire Support Base Chamberlain, they moved to an area south of Bearcat Base Camp called FSB Colorado. Two months later, they went to Thien Ngon to build FSB Sparta near the Cambodian border. 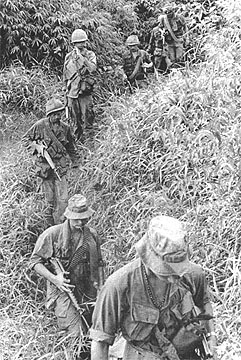 After pausing during June at Cu Chi for a brief stand-down, they were off to Phuoc Tuy Province. There they are in the process of building FSB Lynch. One more move and they'll probably have to put their mail clerk away. AND LEAVE THE DRIVING TO HIM ... Specialist 4 Ken Homrighausen of Harrisburg, Pa., was selected as June's division driver of the month. Homrighausen, of the 25th MP Company, received the award and a three day pass as the result of his attitude toward safety, his excellent preventive maintenance record and his high level of performance. If you hanker to be nominated for division driver of the month look up division reg 385-1. You must meet the qualifications noted therein plus be selected as the best from your battalion. "ME TARZAN. 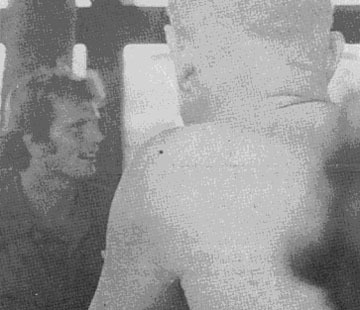 YOU GRUNT"...Ron Ely, television's Tarzan, swung into Fire Support Base Kien a couple of weeks ago to chat with the Regulars of the 3rd of the 22nd. He talked on subjects ranging from sports to Raquel Welch, not too broad a range when you consider the range of the broad. The Regulars were reportedly impressed with Ely's sense of humor, his intelligence and the length of his hair. Can't you just see him trying to get on a Freedom Bird for a flight back to the world; "Sorry, troop," an ol' sarge will say. "You can't get on this plane until you get that hair cut to proper military standards." "But, sarge, I'm Tarzan." "Sure. And I'm Jane. Now get it cut or you're not boarding the bird." FSB KIEN - According to cooks of the 2nd Battalion, 12th Infantry, feeding infantrymen is like trying to befriend a Vietnamese water buffalo - an almost impossible task. To fill a daily menu, the "pot and pan" unit puts in long hours. The mess hall day begins at 4:15 a.m. and usually ends at 7:00 p.m. There's nothing so intimidating as a battalion of hungry men - ask any cook. Whatever the grunt's task, whether it's a daytime search, digging in for a nighttime ambush or building bunkers -- there's one thing he just can't do without -- "mess hall support". [he necessary dietary requirements of such things as vitamin A, riboflavin, ascorbic acid, etc., may not be contained in the most exotic or delicately prepared dishes, but Army chow is "fortified" and plentiful. According to Mess Sergeant Bill Loghry, Riverton, Wyo., during a typical battalion breakfast approximately 1,500 eggs and 150 pounds of bacon are consumed. In the course of a normal day it's not unusual for the men to devour 420 pounds of meat, 600 pounds of potatoes, 120 pounds of butter, 88 pounds of celery, 120 pounds of butter, 88 pounds of celery, 120 pounds of vegetables and wash it all down with 100 gallons of Kool-Aid and 1,000 quarts of milk. A BIRD ON A STICK IS WORTH TWO IN A SCRO DITCH ... Specialist 4 Garlan Duff, Triple Deuceman from Kewanna, Ind., gives his pet parrot Joe a lift while enroute from Tay Ninh to Katum. THE LONG AND WINDING ROAD - Triple Deuce Regulars leave the high and dry comfort of their armored personnel carriers behind and negotiate this back jungle trail near Katum on foot. Monsoon rains made legmen out of the mech unit. Photo and Story By SP4 HENRY G. ZUKOWSKI JR.
KATUM - Heavy rain recently bogged down the 2nd Battalion (Mech), 22nd Infantry's armored personnel carriers near here, so the Triple Deuce riflemen took to the ground in search of the enemy and his hiding places. 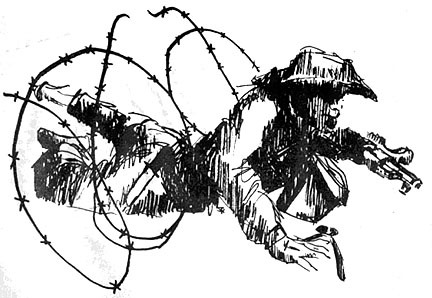 Toting web gear and weapons, the Regulars set out to search some marshy lowlands and ended up destroying more than 45 bunkers in one day's operations. "We carried a small arsenal of light machineguns, M-16 rifles, grenade launchers, small arms ammunition, food and water," said Sergeant Ron Schaeff, of Dayton, Ohio, a Bravo Company squad leader. With tracker dogs leading the way, the dense underbrush and jungle, watery marshlands and mud-filled pathways were no obstacle for the new ground-pounders. "The going got rough in the deep waterways and thick mud," said Specialist 4 Robert Rivard of Linwood, Mich., "but we kept going." 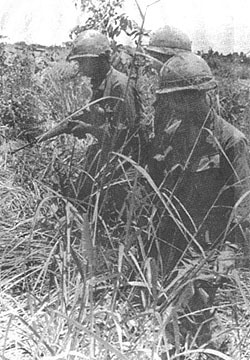 In addition to bunkers, the Bravo Company sweep turned up numerous tunnels, trails and fighting positions. "We even found an enemy-built dam used to stock fish," Specialist 4 Royal Mattson, of Minneapolis, Minn., said. THROUGH BAMBOO - The men of Bravo Company, Triple Deuce, sweep through bamboo thickets on foot, a new experience for the mech unit. TWO FEET DEEP -- Impassable waterways stopped their armored personnel carriers, so the men of Triple Deuce's Bravo Company hoof it. TAKING TEN -- Sergeant Robert Butters of Bradford, Pa., drains his water pouch while on operations with Bravo Company, 2nd Battalion (Mech), 22nd Infantry near Katum. COME OUT - Two members of Bravo Company, 2nd of the 22nd search an enemy bunker found near Katum. THRUNG HIEU - It doesn't usually cost anything to conduct a medical civic action project (MEDCAP) - but, it cost the First Wolfhounds a buck when they accidentally hit a chicken with their jeep in this tiny hamlet. The team came to this remote spot from mud-covered Fire Support Base Jean in Xuan Loc province. It was headed by 1st Lieutenant Tom Maynor, Birmingham, Ala., the 1st Battalion, 27th Infantry's civic action officer. He brought two medics with him: Specialist 5 Frank Jeunemann, Selden, Kan., and Specialist 4 Greg Stoichoff, Lewiston, Pa.
With a box of medical supplies on the front of their jeep, an M-60 machinegun mounted behind and no radio, the three set out taking anxious glances at the woodline and keeping tight grips on their weapons. At a district Military Advisory Command-Vietnam (MACV) compound, Maynor asked for and received directions to Thrung Hieu. Then he traded his jeep for one with a weak radio and, against the advice of some senior NCOs, set out over bad road for the hamlet. There had been reports that an epidemic existed in Thrung Hieu. "Nothing was to be gained by standing around," Maynor said. Taking a left at Bao Dinh hamlet, the jeep sped down the moist mud road of the Sparrow region, nicknamed by the 11th Armored Cavalry which used to operate there. The road was so bad at one point that Stoicheff, who was driving, was forced to take a bean path detour. After that, the jeep pulled out of the woods and headed across the open fields of the fertile Sparrow Valley with Thrung Hieu in sight still several minutes away. Dodging children and chickens in the crowded road, the team weaved its way to the 285th Regional Forces outpost on the edge of the community. The commander, a captain, was the only Vietnamese who spoke English. The medics persuaded him to act as interpreter. Leading the way in his jeep, the captain took the Wolfhounds to the hamlet's schoolhouse. Classes were in session. But after the three-man team arrived, there was bedlam. Not many MEDCAPs come to Thrung Hieu. The captain spoke to the people and the elderly school teacher settled his students down with some healthy taps with his pointer. "It was one of the most orderly MEDCAPs we've conducted," Stoicheff said. "Usually the kids are all over you, pulling at your equipment, but we didn't have that problem here." As Stoicheff began treating patients he found no signs of an epidemic which relieved everyone on the team. Aged grandmothers, with grandchildren strapped to their backs, crowded around the medics waiting their turns. The children were the focal point of attention. Many had sore-infested scalps and varying ailments. When they had all been treated Maynor helped his medics load their equipment back on the jeep, thanked the captain for his help and waived good-bye to the people. But, as Maynor's jeep crept out of the village a chicken ran under its wheels and was killed. Children ran out pointing accusing fingers at the soldiers. Manynor immediately turned the jeep around and headed toward the RF outpost to apologize. After the lengthy apology Maynor paid one dollar for the chicken and left the surprised captain scratching his head. XUAN LOC -- When a man comes to Vietnam for his third tour, he usually isn't too happy about it. But Staff Sergeant Dale Ulam was. His son was waiting for him over here. The grey-haired 46-year-old native of Myrtle Creek, Ore., and his son, Specialist 4 Clifford D. Ulam, also of Myrtle Creek, are members of Charlie Company, 725th Maintenance Battalion, in direct support of 25th Division's Fire (2nd) Brigade. The elder Ulam is his son's platoon sergeant. "When my son was sent to Vietnam," Ulam explained, "I knew that I was about ready for another tour, so I decided to come over and join him. As a third timer I had no trouble getting what I wanted." With more than 18 years in the service, Ulam plans to retire, just about the same time his son gets out of the service. "During duty hours," Ulam related, "he has his job and I have mine. We just decided that we'd come over together and we'd leave together." The elder Elam is the unit's NCO in charge of supply and his son is a supply clerk. When asked whether his son intends to make it a career, Ulam said he didn't think so. "He's probably happy to see me get out," he added. DEAR SGT CERTAIN: Our second lieutenant planned a MEDCAP for our platoon last week. We went to a friendly hamlet, where one of the guys, who used to be a male nurse, tried to take a splinter from a mama-san's finger. But there was a little blood and the lieutenant, the male nurse and four of the guys fainted. Mama-san and some of the children helped me carry the guys back to Cu Chi. Do you think these things really aid pacification? DEAR PFC: They certainly do. MEDCAPs give the Vietnamese villager a chance to make a significant contribution to bettering relationships with the GI. The villager shows his good faith by taking the medicine and candy the soldiers pass out - after all it might not be clean. By waiting in line for treatment, villagers show their respect for Army methods. Lines are an Army tradition, you know. Sometimes, as in your case, the Vietnamese can go beyond just humoring the troops and can actually do something nice to help. DEAR SGT CERTAIN: Is it true you just RE-UPed? What kind of bonus did you get? DEAR SIMP: I've been in Uncle Sam's family a long time now, but come RE-UP time the division is always so scared to lose me that they offer an attractive package. After a short leave to the States I came back and found my hootch repainted from top to bottom. Even my bedsheets were covered with a bright crust of OD. I have my own table with a placecard outside the back door of the general's mess. My hootch maid now wears a low cut dress, but best of all - they promised me I could extend another year and keep away from my nagging wife. The Army is a real deal. FSB REDLEG -- Far back in the annals of history, United States artillerymen wore red leggings as a standard part of their uniform. Hence the name "REDLEG." 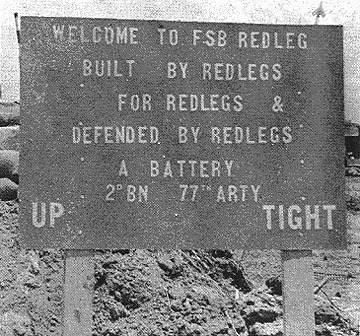 A short time ago, the members of A Battery ,2nd Battalion, 77th Artillery, built and named their own fire support base "Redleg" after the tradition. 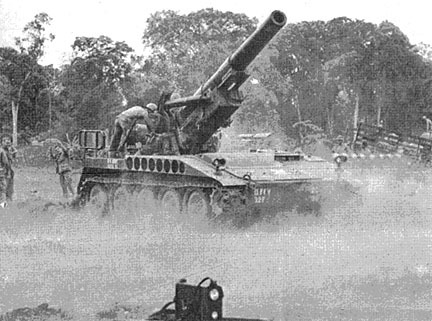 Located in the Iron Triangle, North east of Cu Chi, FSB Redleg is a unique concept in the employment of artillery field support. The construction of Redleg was a demanding task and the finishing touches still continue. Elements of the 65th Engineer Battalion cleared the ground using heavy earth-moving equipment. Then the Up-Tight cannoneers worked long and hard erecting bunkers, howitzer parapets and establishing a perimeter defense complex. Physical layout of Redleg required careful planning to insure maximum tactical effectiveness. It had to be compact enough to eliminate vulnerability yet large enough to allow for personnel and equipment mobility. Whenever an artillery battery locates, one howitzer is always designated as the "base piece" and all other howitzers are positioned in relation to it. This configuration of howitzers provides overlapping sectors of fire. The life and the work are rough but there are some conveniences, too. A new shower was recently constructed and the mess tent serves good, hot meals. INFANTRY SWEEP? -- No, an artillery sweep. Cannoneers of A Battery, 2nd Battalion, 77th Artillery check the area surrounding FSB Redleg. READY -- Cannoneers of A Battery, 2/77 Arty test-fire rounds on their M102 howitzer at FSB Redleg. PRECISION -- First Lieutenant Greg Solomon uses an aiming circle to lay all howitzers on the same base deflection (direction). Solomon is the executive officer of A Battery, 2nd Battalion, 77th Artillery at the all-artillery Fire Support Base Redleg. 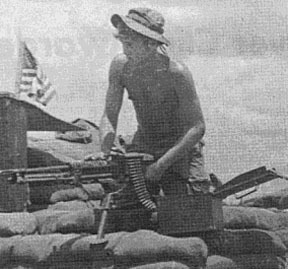 ARTY SECURITY -- Specialist 4 Jack Gery of Danville, Va., sets up his M60 machine gun in preparation for night bunker guard on the perimeter of FSB Redleg. When the 1st Battalion, 27th Infantry, moved into a new area of operations recently, their new neighbors turned out to be an element of the Royal Australian Task Force. The "Aussies," engineers and legs, are rebuilding part of Highway 2 in Phuoc Tuy Province near Fire Support Base Lynch. Even before the dust completely settled from the building activity at FSB Lynch, several of the Wolfhounds hitched a ride up the Highway 2 and paid a social call on their mates from down under. As anyone who has been to Sidney on R & R will tell you, the Australians are excellent hosts and the unexpected Wolfhounds found cold cans of Schweppes lemonade awaiting them as they arrived. With such good hospitality it was inevitable that a heavy rap session would begin. Questions from both sides came fast and furious. Favorites among the Wolfhounds were: "How long are your tours in Nam?" and "Where are the really good places to go while on Romeo-Romeo in Sidney?" Meanwhile the Australians were countering with questions ranging from the fine points of American "motor cars" to the cost of living in the United States. One topic of special interest was national service, known in the States as the draft. According to several of the Aussies with first-hand experience, a man becomes eligible for national service when he registers at age twenty. His name is then placed in a ballot box and the needed number of names is drawn three times each year. Once drafted into the Army, the Australian soldier serves a full 24 months. And if he serves in Vietnam, he serves 365 days. The Aussies get no early outs or drops. When asked if he thought the Aussies would ever go to the United States for R&R, Alcock just laughed and said, "I doubt it. I have never been to the States. But I would sure like to go." Another interesting point for the Wolfhounds was a description of the Australian version of the mad minute, (free fire period) called a "yippie." "I guess the name was taken from Americans western movies where the cowboys shoot like crazy," said Sergeant Arthur Fancis of New Castle, New South Wales. 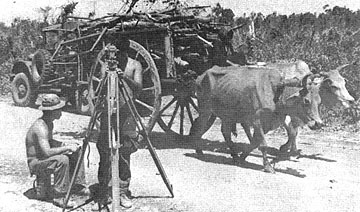 THE OLD MEETS THE NEW -- While Specialist 5 Dennis Munoz of Great Bend, Kan., sets up a theodolite, Specialist 4 Herbert Sargent of Williamston, S.C., watches a passing oxcart. The two surveyors are members of the 7th Battalion, 11th Field Artillery survey team. 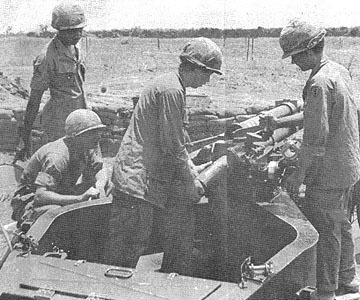 CU CHI - A big problem in the field for the 2nd Battalion (Mech), 22nd Infantry, has been rashes due to heat and constant moisture. Although all of the standard treatments were tried, the rashes persisted. Recently, however, a battalion medic came up with a new-type ointment that has proven highly effective. "I call it 'Virgin Water'," said Specialist 5 Edwin Rugh Jr., a clinical specialist at the Triple Deuce aid station, from Long Beach, Calif.
Rugh, who was a Bio-Chemistry major in college, happened to be looking through a medical journal. "There was an article explaining the chemical bases for known rash ointments. 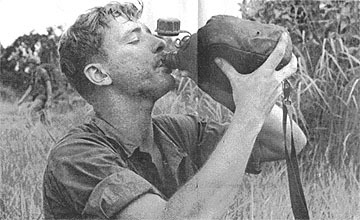 I combined the ingredients from several of the formulas and devised a medication I thought might help our troops here in Vietnam. "It's clear, like water, but it's a mixture of several liquid chemical compounds," Rugh, said. His first patient turned out to be a fellow medic, Specialist 4 Damien Alders, of Bravo Company. "I had tried many so-called remedies," Alders, of Danville, Ill., said, but the rash persisted for several weeks. With 'Virgin Water,' however, it cleared up in a week. "When I returned to the field," Alders continued, "I brought several bottles of it with me. The results were great and helped make my buddies a lot more comfortable." The good news quickly spread about the 'Virgin Water' treatment. "Not only did my rash clear up, but the nagging itch from it stopped immediately after application," said Specialist 4 Paul Masotta, of Bravo Company, from Woburn, Mass. "I call it `Virgin Water' because it clears up the skin and makes it pure," Rugh added. DAU TIENG - Everybody knows that the last thing a clerk can expect to receive is a valor award. So a few imaginative clerks from 7th Battalion, 11th Artillery's S-1 shop invented their own valor award. It's called the Silver Paper Clip. Specialist 5 Pat Howard, being the shortest man in 7/11's S-1, decided to make himself the first (and probably the last) recipient of the medal. The citation put together by Specialist 4 Robert Pettry, the awards clerk, pretty much described what Howard did to earn his medal. "Specialist Howard," the citation reads, "distinguished himself with conspicuous gallantry and intrepidity at the risk of his life when he single-handedly answered over 200 telephone calls, and processed in fifteen new men, exposing himself to a hail of questions from the new guys. Perhaps the real significance of the award was brought out by Specialist 4 Dave Fellows, the headquarters clerk, who said, "You might say that he (Howard) is our combat legal clerk. He went up to Katum once to get the colonel's signature." TAY NINH - The men of the 4th Battalion, 9th Infantry are members of one of the oldest, most highly decorated combat units in military history. They show their pride in a special way. The original 9th United States Infantry Regiment, from which the Manchus have descended, was recognized for its outstanding combat success by being allowed to wear a distinctive belt buckle with the Class A uniform. It is the only unit in the U.S. Army authorized to wear such a buckle. The unit, formed in 1798, has seen action in all U.S. combat involvements from the War of 1812 to Vietnam. The 4th Battalion, 9th Infantry now holds the greatest number of campaign ribbons of any Army unit. The bronze Manchu buckle features a five-toed Chinese dragon signifying the unit's service in the Boxer Rebellion. The background is composed of a pattern of wigwams and sunbursts in honor of the Indian Wars and for the service in the Phillippine Insurrection. 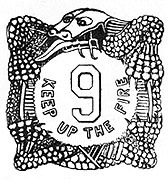 The center of the buckle contains the number "9" and the Manchu motto: "Keep up the Fire." KATUM - The men of the 25th Division's Alfa Company, 2nd Battalion (Mech), 22nd Infantry recently dealt the enemy a double dose of his own medicine with fatal results, using two mechanical ambushes to kill four Communists near here. 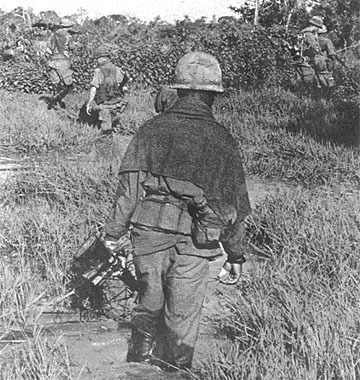 After selecting designated enemy pathways, trails and possible supply routes, members of the Triple Deuce set out from their night defensive position to plant claymore mines. 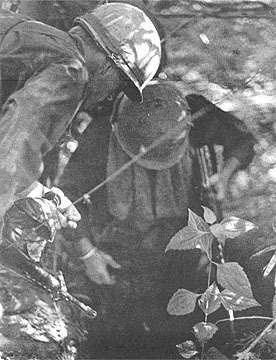 "Often only a few men are used to set up the ambush," said Specialist 4 Joe Semegi, of Chicago. "Using as few men as possible gives the enemy less chance of detecting us." With mines planted and ready to detonate, the Regulars returned to their night laager position. The following morning, a sweep turned up two enemy killed, one AK-47 rifle and more than 200 rounds of small arms ammunition. Another ambush site nearby yielded two more enemy dead, 200 rounds of ammo, one AK-47 rifle and documents. "By using the mechanicals, the enemy has less chance to move freely at night. INTO THE BUSH - These members of the recon element of the 2nd of the 12th file into the bush in search of Charlie during operations near FSB Warrior. ©2005 25th Infantry Division Association. All rights reserved.